to review for the final exam. At noon on Thursday, May 29, on the patio outside Kemeny, there will be a barbecue for Mathematics Majors and Minors. You wake up one morning and in the half-light you ... notice that your loved one is gone and find a note on the pillow saying `I LOVE XOU'. Almost certainly this will reassure you, as you will assume that in the dark the Y became an X. Of course, this is not 100 per cent certain. It is possible that the X was intended for L and that you have been abandoned for your close friend (or so you thought) Lou. 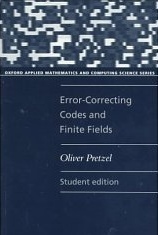 So begins the book Error-correcting codes and Finite Fields by Oliver Pretzel, the book we will use as a resource in Math 75, Applied Topics in Number Theory and Algebra. Error-correcting codes are a relatively recent mathematical invention; they are behind accurate cell-phone reception and good quality CD's and DVD's. But they are just one application of the theoretical concept of a finite field, a topic which is close to two-centuries old in abstract algebra. Math 75 will develop the necessary theory, and then present applications. Besides error-correcting codes, if time permits, we will look into other applications such as the notorious "abc conjecture" and algorithmic questions of recognizing prime numbers (including the recent sensational test of Agrawal, Kayal, and Saxena, which was the subject of the latter two's joint senior thesis). This book is now in stock at Wheelock Books. Lectures are MWF, from 10:00 AM - 11:05 AM in Kemeny 105. The X-hour is Thursday, from 12 to 12:50. While we will not have normal class on the X-hour, it is likely that it will occasionally be be used for review sessions. If the final exam is the lowest grade, then homework, the two midterms, and the final exam each count for 25% of the grade. If either the homework or one of the two midterms is the lowest grade, then that grade is dropped. In this case the other two pre-final exam grades count 25% each, and the final exam counts for 50% of your grade. On exams and quizzes no help can be either given or received. On homework, you should feel free to discuss the problems and to work together in solving them. However, the final write-up must represent your own work; no one can write up your assignment in your place, nor can you merely copy someone else's completed assignment. Homework problems are designed to be doable using the course text, notes, and lectures. Outside references (including books and online sources) may be used, but any such references must be cited in the final write-up. Keep in mind that while going afield for solutions is perhaps a good talent, it is no substitute for working problems out yourself. If you have any questions as to what is or is not acceptable within the honor code, please talk to one of the instructors. Honor code violations are taken seriously, and any suspected breach must be brought before the Committee on Standards. Students with disabilities who may require special accomodations should speak to an instructor as soon as possible. It is also advisable to stop by the Academic Skills Center in Collis to register for support services. Also, students who have schedule conflicts with the course due to religious observances should make arrangements with one of the instructors as soon as possible (before the second week of class).